You want to give the handyman/woman thing a shot, but you don't want to invest in an entire toolbox worth of gear in case it turns out you're inept. 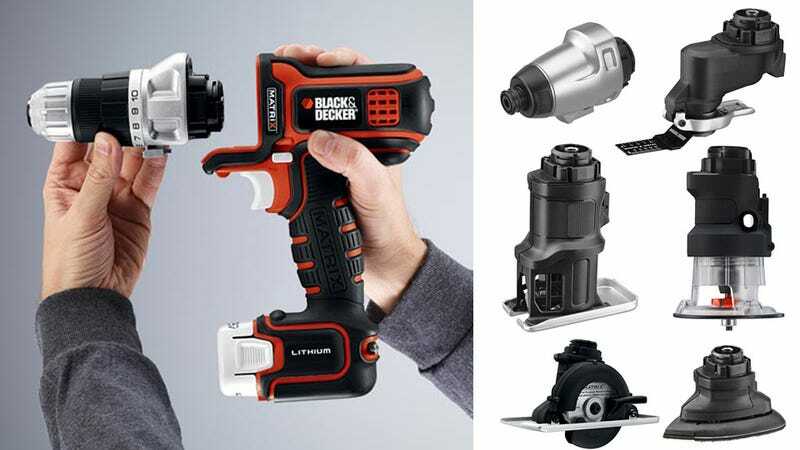 Try Black & Decker's new Modular Matrix system—it fits most of a workshop in one relatively affordable handheld tool. Other modular tool systems let you share a rechargeable battery between multiple devices, but the Matrix base power unit lets you swap in different heads for different jobs. The single handle comes with a drill/driver attachment, which pops off for use as a sander, impact driver, oscillating multi-tool, jigsaw, router, or a trim saw. The rechargeable base units come in a 12 volt model for $50, and a 20 volt model for $70. If you don't mind a cord, a 4.0-amp AC tethered model will set you back just $40. And the six attachments will range in price from $30 to $40 when the whole system goes on sale in January of next year. Wannabe carpenters of the world, get your lumber ready.